An Afghan police officer has been called a “hero” for using himself as a human shield when confronted with a suicide bomber. Police Lt. Sayed Basam Pacha was guarding a hall crowded with dignitaries when a man refused to stop when asked, running toward the crowd. Despite the risk of the suspect being a suicide bomber, Pacha threw his arms around him. And indeed, a second later the bomber detonated an explosive vest, killing 14 people—including Pacha. Seven other police officers and six civilians were killed. Basir Mujahed, a police spokesman, said 18 others were wounded, but the number would have been much higher without Pacha’s self-sacrifice. Pacha’s father, Sayed Nizam Agha, wept as he told what happened to his son. 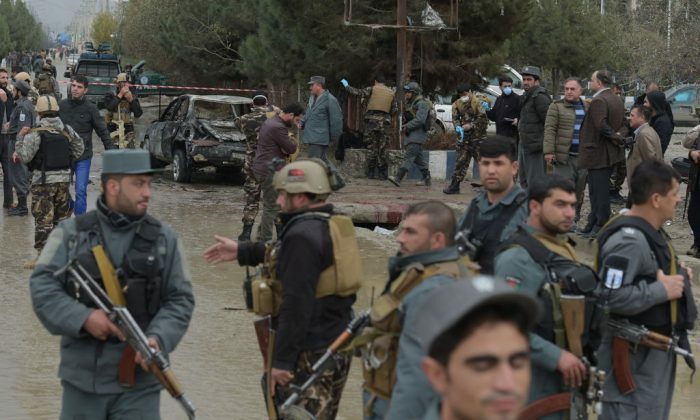 The Islamic State in Afghanistan claimed responsibility for the attack, while the Taliban denied their involvement. “After lunch as we were exiting the hall a huge explosion shook the hall, shattering glass and causing chaos and panic,” he said, according to The Telegraph. Pacha had been on duty in Kabul for a year and a half and had received a commendation from superiors. Friend Sayed Najib Asil spoke warmly of him.